I built a Buchla 289 Dual Defect Processor module for someone else. They sent me a mostly complete kit of parts and I assembled and tested the module. The PCBs, eeproms, and panel are from the ElectricMusicStore and nearly all of the PCB components are sourced through Mouser. I made reference diagrams from raw PCB images. 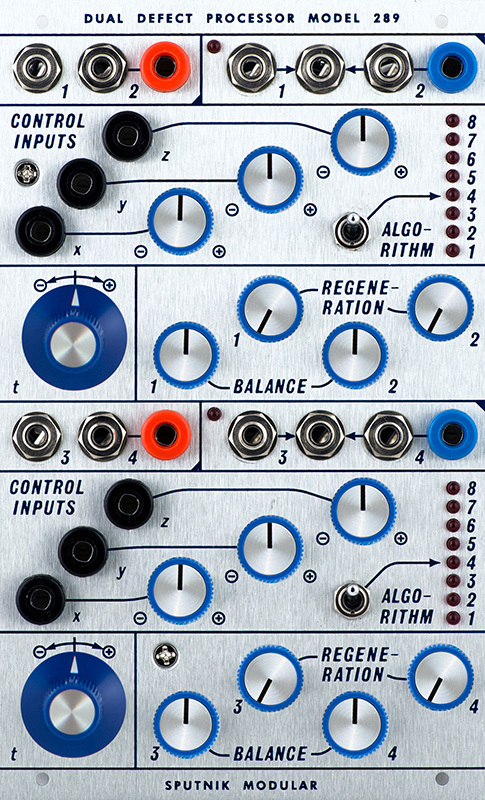 This is a very complex module and the jacks and controls are non-intuitive. The DIY version does not have the same patches as the pre-assembled version. I've created a 2 page PDF with a description of the patches found on the web. The 9mm potentiometers have tabs that touch the PCB. There are several positions on the PCB where there are runs underneath the tabs. I break the tabs away so they will not rub through the solder mask and short to the runs. I wish these PCB layouts would include clearance zones. I always mount the male pins on PCB1 so that PCB2 has the female pins. PCB2 has the power cable and using female headers on the backside means nothing can short to them if PCB1 is not attached. I also solder the female headers first, insert the male pins, and mount the two boards together before soldering the male pins to PCB1. This elevates the male pins a bit off the PCB and ensures they are fully seated when assembled. This PCB uses BAT54S which Mouser no longer carries but they do carry the BAT54SFILMY (Mouser 511-BAT54SFILMY). I also use the front panel to align the switches for soldering. I have the potentiometers mounted but not fully soldered. I always solder one pin, assemble the panel, and then on the 9mm potentiometers solder the remaining pins while centering the potentiometer. For the 16mm potentiometers I reflow the one pin to relieve any stress due to height and then solder all pins. You can see the unsoldered potentiometer pins in this photo. PCB2 has the surface mount SPIN chips. I only used sockets for the eeproms. Two sets of three transistors are labeled A, B, and C which can sometimes indicate matched. You should buy these in cut tape but I matched them on my Tektronix 576 curve tracer. The input levels are a bit hot for standard Buchla levels so the overload light comes on often. The 289 EMCloned build thread indicates to lower R7, R8, R20, and R21 to attenuate the input signals. These resistors are on the rear PCB which is not labeled. These resistors are all 82K5 and lowering them to about 15K increases the signal attenuation by 2.5X. This also attenuates the dry signal to the mix control as well. If instead you increase R13, R14, R15 and R16 on the rear PCB you will only attenuate the input to the Spin FV-1 IC. These resistors are all 100K. I increased them to 200K which increases the signal attenuation by 2X. I added sockets for these resistors so the owner could easily change them.